Backup and Restore Master Boot Record: "The Master Boot Record (MBR) is the very critical part of a computer system. If it is damaged due to a virus attack or by other means your data on your hard drive may lost forever. The MBR Backup tool helps you in such critical situation. The new version of MBR Backup tool (v.2) allows you to restore saved backups in the event that your MBR becomes corrupted. You can do this by connecting the drive to another computer. Another very helpful feature of this new version is its ability to view the partition which is table contained in the MBR. 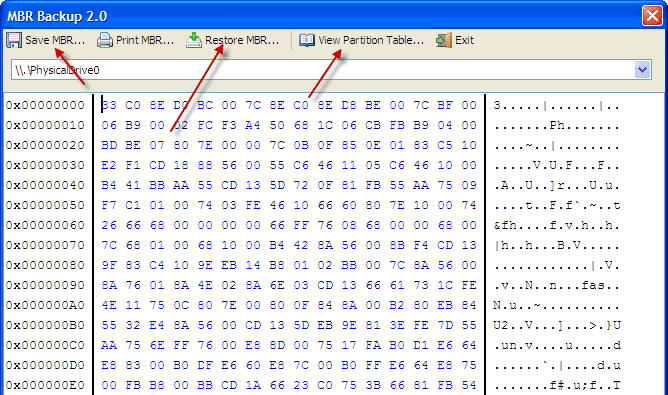 Moreover, this new version will also show the MBR on any drive connected to the computer.